Though economists like to tout property rights as a wonder-cure for virtually everything that ails us, Columbia University law professor Michael Heller explains how all sorts of innovation and market growth is killed in the cradle simply because there are too many rights-holders with too many divergent concerns. It can be extraordinarily costly to identify all of the people with property stakes in a given field, and even if they can be found, many have no wish to sell their rights. Such "holdouts" can effectively block new research on malaria drugs, plans to consolidate an urban university campus, and attempts by mobile phone companies to build a seamless national network of service. Gridlock prevails, and we are all the worse for it. My blog post, July 22, 2008. Edited by Mark Kurlansky. Riverhead Books, 2009. Americans have gotten so accustomed to getting food from supermarkets, which are supplied by huge corporations with heavily advertised, brand-name foods, that it is sometimes hard to imagine a world of rich, homegrown variety. If you went to Nebraska, you once got Nebraska baked beans. If you went to Georgia, you might get possum and taters. Alabama kitchens would serve up oyster roasts, Rhode Island would serve Jonny Cakes and Montanas considered fried beaver tail a delicacy. 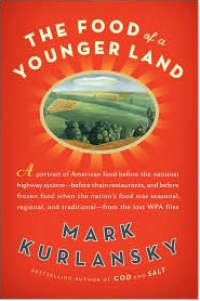 One measure of what our nation has lost -- in terms of culinary variety and authenticity -- can be found in a new book, The Food of a Younger Land, which collates forgotten food reportage by the Federal Writers' Project from the 1930s and 1940s. My blog post: "Back When Food Was Really Local," June 15, 2009. By Eduardo Moises Penalver and Sonia K. Katyal, Yale University Press, 2010. Private property rights are extolled as the most powerful engine for "progress" — which has led to the idea that the stricter and more absolute those rights, the better. It is the conceit of Property Outlaws that the dissenters to this catechism play an invaluable role in making property law more socially responsive and functional. Or as the subtitle of the book puts it, "how squatters, pirates and protesters improve the law of ownership." Property Outlaws is the rich, neglected history of conscientious objection to property law. 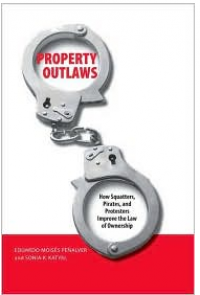 My blog post: "Property Outlaws." By Robert Ellickson. Princeton University Press, 2008. Yale law professor Robert Ellickson, a property law and economics scholar, has seen the invisible in the obvious -- that our individual households, as systems for managing shared everyday resources, function as a commons. They interact with the law and with the marketplace, but have their own social and economic dynamics. 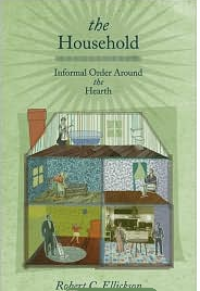 The Household is a short but thoughtful exploration about how and why households function as the do. (The book is an outgrowth of a 2006 essay in the Yale Law Journal, which can be viewed here. ) Ellickson is that rare law scholar who understands that what happens beyond the law, in people’s personal and social lives, can be at least as influential as the law. My blog post, "The Household as Commons." By Melinda Blau and Karen L. Fingerman (W.W. Norton, 2009). 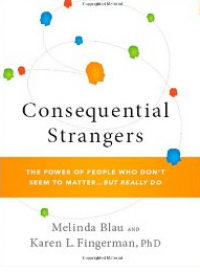 Book describes the overlooked importance of casual strangers to one's sense of community and personal well-being. My blog post, December 29, 2009. By John Henry Clippinger. Public Affairs, 2007. Modern economic thought is built upon a narrative for “human nature” that casts us as selfish, materialistic individuals. 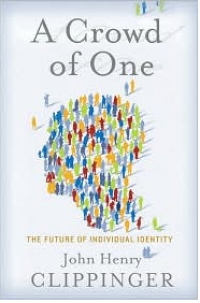 So what if it could be shown, with some scientific rigor, that human beings are in fact a creature with other vital attributes -- that they have successfully survived over millennia by showing keen capacities for trust, empathy, reciprocity and collaboration? That is a key theme in a fascinating new book by John Henry Clippinger, A Crowd of One. My blog Post: "A Crowd of One." By Samantha King. University of Minnesota Press, 2008. What happens when corporate marketers commandeer a grassroots health movement and turn it into a mini-industry? 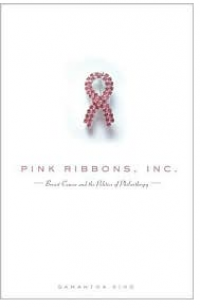 Samantha King provides a revealing look in her book, Pink Ribbons, Inc., King, a professor at Queen’s University in Kingston, Ontario, describes how corporate marketers have transformed a once-stigmatized disease into a branded cause that subtly serves their commercial self-interests. The danger of the whole "win-win" rhetoric used by the pink-ribbon marketers, is coming to believe that there are no losers. In fact, as Samantha King points out in this brave book, the corporate takeover of breast cancer activism has marginalized all sorts of important issues about breast cancer that deserve our full attention. My blog post: "The Pink Ribbon Juggernaut." Joi Ito, the globe-trotting investor, democratic activist and CEO of Creative Commons, got frustrated that no one seemed to have a good photo of themselves that they could share. "People who are invited to conferences get asked all the time, 'By the way, do you have a photo that we can use?’ But they don’t." Or if people do have photos of themselves, they generally aren’t legally usable. The photographer owns the copyright, and so anyone wishing to use the photo must obtain permission first, and perhaps even pay for usage rights. So in 2007, Joi, an accomplished amateur photographer, set about assembling his own collection of 296 "freesouls" -- photos of friends and associates of the free culture movement who were willing to share images of themselves with the world. My blogpost, February 16, 2009. By Peter Linebaugh and Marcus Rediker. Verso, 2000. This book brings to mind Howard Zinn’s People’s History of the United States. 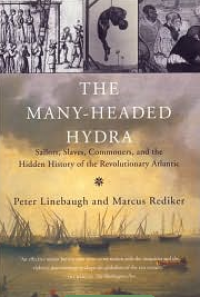 It tells how slaves, soldiers, sailors, factory workers, laborers and other commoners from dozens of countries were pressed into the service of global capitalism in the 17th and 18th centuries. Proto-capitalists eager to accumulate wealth from global trade and conquest quickly realized that their work required the enclosure of the commons. They also needed to devise new types of servitude — wage slavery, indentured servitude, impressment onto ships, and outright capture and slavery. People were forced to work on ships and plantations, and in factories and distant colonies. The maritime state arose to facilitate the amny enclosures of the commons and new types of forced servitude. My blog post, October 21, 2008.